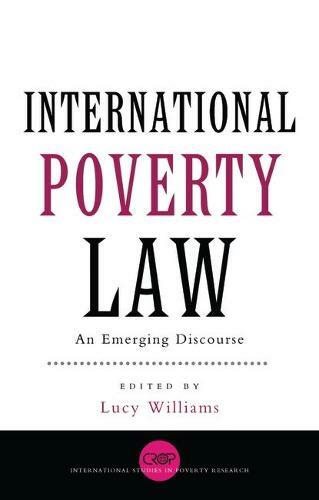 This book seeks to advance the emerging field of international poverty law. While law and development discourse has dealt with international poverty, advocates of poverty reduction customarily operate within a nation-state context. The contributors to this volume, while largely, although not exclusively, relying on human rights discourse and United Nations, International Labour Organization and World Trade Organization initiatives as their primary legal sources, begin to position international poverty law as a legitimate field for transnational, multidisciplinary legal research and dialogue. While critiquing both legal theory and current policy, they nevertheless open up a constructive prospect of specific arenas in which the development of international poverty law can contribute to addressing poverty reduction. The opening chapters of this volume provide a framework within which to position the future theoretical development of international poverty law. The rest of the book explores specific human rights initiatives that address particular aspects of poverty. These include an overview of human rights conventions and how they can be connected to international poverty law; measures required to counter the tendency of intellectual property law as applied to biological products and processes to undermine food security; the right to food as framed in United Nations development documents; the potential role that voluntary codes of conduct currently being adopted by some transnational corporations might play in poverty reduction; and the startlingly important development in the new South Africa of an alternative vision of constitutional law that takes account of international human rights instruments in moving towards rendering social and economic rights justifiable.